was one of a litter of nine puppies picked up by animal control in a small Texas town in early July, 2008. We drove to Dallas and picked him up from a rescue when he was about 12 weeks old. 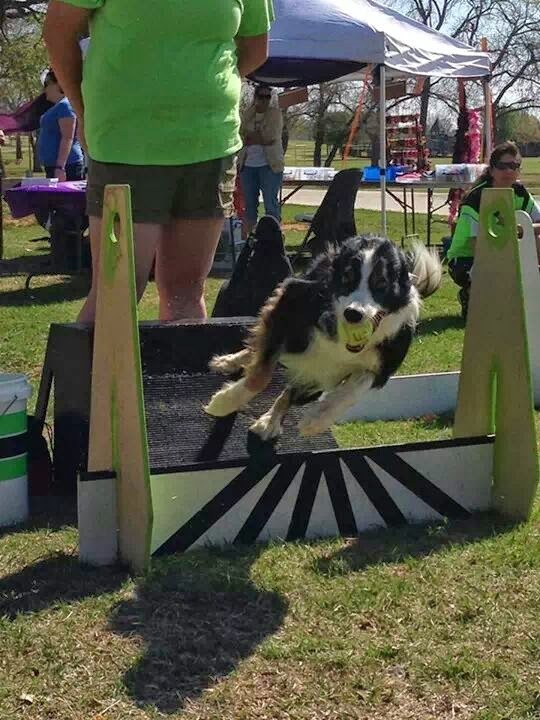 Border Collies are my favorite breed for all of the reasons that get too many of them into trouble with owners that aren't prepared for living life with this breed. Not everyone is cut out to provide the activities, exercise, and mental stimulation needed for the majority of BC's. I try to help with rescuing abandoned border collies from kill shelters when I can, but it's a heartbreaking issue at times. At any one time, there are at least a dozen that I'm following across the country that I'd adopt myself if I could. Instead, I do what I can to help and try and get them out of a bad situation. If you're ready for a border collie, please be open to the idea of rescuing one from a shelter. So long for now..... I love you too too much! We did about a 12 minutes warm-up walk on level surfaces, followed by 7 or 8 repetitions of going down and up a 30 degree grade (20 yds of incline each). This was followed by a 5 minute walk back to the house. Two repetitions of five each (flexions and extensions) followed by six reps sit-stand exercises. He did the first three for 5 seconds each, then did 4 seconds on the last two. We followed up with another 10 minute cool down walk on level surfaces. I'm pretty sure we'll get another evening walk in. Observations: Zio is really enjoying the walks and has a bounce in his step. We did come upon someone's "outside" cat and he was really driving with his back legs to get to the cat. Good thing he had a leash on! He appeared less sore today than yesterday morning, so I'll keep hoping that we're making progress! Just a morning and an evening walk with ROM exercises after each this day. He seemed a little sore in the morning, but slightly better in the evening. We did the same basic routine as yesterday with the following difference. On the down-sit-stand exercises, I tried to get him to hold his stand for five seconds each time. Some made it to three, others to four, one solid stand for five seconds. It may just be a balance thing, because his best one was the last one. Did a second walk in the evening, about a mile in 20 minutes. Observations: He loves going out walking and didn't seem to tire quite as much as yesterday. I did get a reaction from him while doing a flexion stretch on his right rear and accidentally extended his leg while his hip was rotated out. I didn't try it again, but I did try to gently duplicate the movement on the left rear and it did not get a reaction. I may try that again in a week or so to see if he is any better with that movement. He did seem a little sore later in the evening. Tomorrow will be just walks and ROM work. Again, it's been a while now, but I'm going to use Zio's blog to jot down notes and observations of Zio's hopeful rehabilitation. Zio is 6.5 years old now and had been running his best times in flyball last year through May. He was consistently running 3.9's ltl, with an occasional 3.8 in the mix. This was about two years after his old vet thought he might have a partial tear of his ACL. He returned to racing in about three months after that diagnosis, with significant rest follow by a gradual return to full exercise and practice. Last spring, I noticed that he tended to be fairly sore after a Saturday of racing, but was ready to go on Sunday mornings. He had an issue with the nail bed bleeding after activity last June, which combined with other injuries on the team, limited our tournament activity to zero for the last half of the year. At some point during the late summer, I noticed he was really struggling to get up after laying down for any length of time. My thought as this point is that he may have injured himself last year playing frisbee. I let him rest more, which didn't seem to help. I went to the vet suspecting he was showing signs of hip dysplasia. The vet examined him, but could not pinpoint any pain points or discomfort and felt like he might have some inflammatory issue going on. I went home with some Rimadyl to use after activity. He did seem to improve somewhat with rest, so I've been trying to just let him be a dog and take it easy. With continued rest though, I've noticed he is starting to lose muscle mass in his rear end. I took him to a chiropractor and she said I should try getting him to walk backwards, uphill preferably. With more time going by and no significant improvement, additional research has led me to several good articles on rehabbing hip dysplasia along with some articles on hip flexor or iliopsoas strains. The iliopsoas strain rang a bell because I had read an article on that when I was reading about partial ACL tears and how an iliopsoas strain can be misread as an ACL issue. 10 minute warm up walk, followed by two cycles of 30 yards walking down a gradual (10 degree) incline and back up again, and then another 10 minute walk again. Back home we did two reps of five extensions and flexions on each side. He definitely seemed tighter on his right rear extensions. This happens to be the same as the suspected ACL issue two years ago. We then did one rep of five sit-down-sit-stand exercises. For this session, I had him hold the stand for one second, then two, three, until he held five seconds on the last one. We followed with a 10 minute cool down walk with a five minute massage afterwards. Edit: We did a 10-15 minute walk in the evening to warm the muscles up. This was followed by two more reps of five rear leg extensions and flexions on each side. He tolerates the stretching with no indication of discomfort. He did seem slightly more comfortable getting up from a down position, but that's probably me being hopeful. General notes: He started out very excited to get out, but was tiring by the end of the cool down walk. He kept the bounce in his step and did not seem uncomfortable walking. Right leg seemed tighter, but gradually seemed to get full ROM. I don't want to over do it on the first day, but we may take another walk later. I'm expecting some soreness due to lack of condition, but we'll wait and see if he needs a day of rest before another full session. It's been two years since Zio was preliminarily diagnosed with a partial CCL tear by my (ex)vet. A friend referred me to a forum group that discusses dogs with orthopedic issues. I also did a lot of research online to consider available options. Everyone seemed eager to jump to the conclusion that immediate surgery (knee reconstruction) was the best solution. I did get a referral from my vet to the leading orthopedic surgeon here in Oklahoma City, but I never felt completely comfortable with the diagnosis. Without exploratory surgery, I think it would be extremely difficult to diagnose a partial tear by manipulation alone. He was never reactionary with manipulation or pressure. The non-weight bearing limp can indicated that the bones are slipping and causing friction if the CCL is torn. With a partial tear, there probably wouldn't be any slipping though. I mentioned the situation to my personal doctor during my annual physical and he thought it was crazy to consider reconstructive surgery on a partial tear. He said they would never consider that a solution on a human patient. I decided to go with six weeks of rest and ordered some Joint Strong supplement powder. We did very short walks around the block initially every other day (off leash, since he thinks he's a sled dog on leash). We gradually built that up until he was going about a mile. The limp disappeared after the first five days. He began practicing again after two months and I've kept him on Joint Strong for the last two years. He is now running his fastest times ever and I'm very glad we didn't just go with the majority opinion and do major knee reconstruction. My recommendation if you find yourself in the same boat? Don't believe the "surgery is the solution" crowd on a suspected partial tear. Do your own research and see what feels comfortable. Ask about non-surgical options. The vet that referred me to the orthopedic surgeon is not my vet any more, but for a different reason though. I should have sought a second opinion, but it worked out well! We switched the line up around on Sunday and he was passing into Teegan. Lucy is very easy to pass into with her consistent turn and recall. Teegan is green and fairly rough with his turn, including several return trips outside of the jumps when he turned wide and took the direct path back to "mom". Needless to say I played it more cautious with Zio's passing. Toward the end, I started trying to get the timing a little closer and dialed the passing in to a moderately comfortable pass, but far from tight. He now has 29,915 U-Fli points as he closes in on his next title of TFFC -III at 31,000 points. Border Staffy sister Luna gave me my first perfect start! She was running for the first time this year after she broke her toe in January chasing a ball in the backyard! She ran on the "B" team as start dog and ran pretty good considering it was her first time in the lanes in over six months. 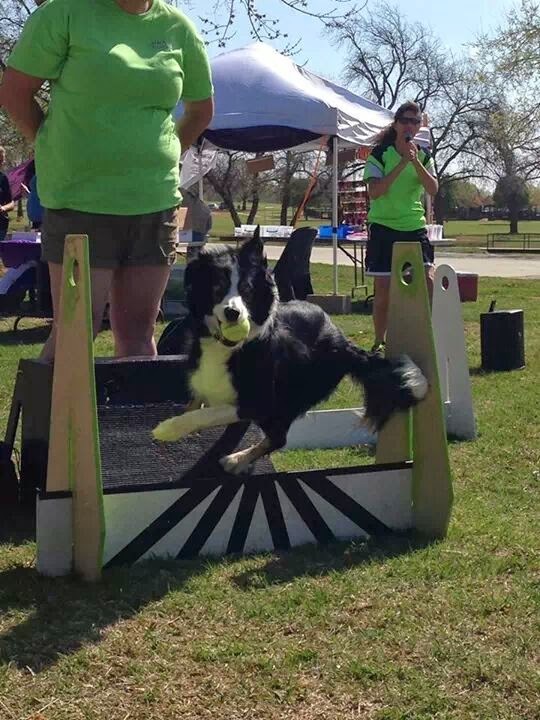 We had fun doing a Bark for Life demo to support cancer research last weekend. We did some flyball demonstrations and then threw some frisbees. It was getting fairly warm, so we tried not to over extend them. Here are a few pictures of Zio's box turn during the event... with props of course!